In that safety, I finally begin to answer His question. “Papa, I used to love the church. I know I did at some point. But now—now I just plain hate her! I do not want to invite any one. I do not want to even be there. I love the individuals but I hate the body. “She is ugly and dysfunctional. She is hurtful and dishonest and abusive. She takes and takes and takes but does not give in return. She is wretched and ugly. I hate her! How can I love that? “You have shown me how to love my husband. But he has laid down his life for me and his children. But the church? She has never been there, never supported, never stood by me. And You want me to choose to love that?” The words tumble out in a flurry. I feel wretched and afraid. Part of me expects understanding from Him. A larger part though expects correction and rebuke. “I will not do that, child.” There is no note of anger in His voice although I cannot fathom why. I hate to even think it, but I do not really understand why He would refuse. I am suddenly aware of a bitter and vile thought. I hate to admit it, but I hear myself thinking, “Why would He turn down the opportunity to hurt me when I am even asking for it?” Tears of hurt and shame begin to flow. I want to hide from Him, but cannot. “Now, we can talk.” His voice is gentle as He shifts me into His lap, pulling me close enough to hear His heartbeat. “You expect, deep within, that I really want to hurt you.” There is no accusation in His words, only a statement of fact. He is right, I do. I really expect He wants to see me hurting. After all, that is what His church has done, it is what my mother has done… Then I realize it is her voice that I am hearing and feeling I this moment. I do not know why, but I have always assumed she wanted to hurt me. The little criticisms, jabs, observations made when I thought I was doing well. I guess they left the sense that she really wanted to hurt me. And worse. I have felt that this is the way it should be so much so I invite and accept it. “Papa! Forgive me! I did not know. I have seen you this way too. Please forgive me! Please help me to see you the right way” I cry into His arms. There is no rebuke, no harshness, no anger from Him. “Forgive her.” He says, I know He means both my mother and the church. “Yes, Papa. I choose now to forgive them both. Please forgive me my lack of forgiveness. I repent Papa, I repent and I choose now to forgive them and release them both to You.” I whisper he words, He has drawn me so close I do not need to speak them more loudly. He says nothing but I can hear the beat of His heart and the soft chimes of grace in my ears. I had not seen that, had not remembered that. I press into Him as He holds me, relieved in seeing this. I am truly safe and secure here with Him. He truly does accept me, not based on my performance. I stumble on the words sacrifice, confused. “Your obedience is a sacrifice child. Do not minimize that. You have chosen to lay down the hurts of the past out of love for Me, asking nothing in return. I do not treat that lightly. “This sacrifice shall be rain upon those seeds. And I will bless your harvest with abundance.” Tenderly He lifts my chin and kisses my forehead, cradling my face in His hand. “I love you Papa.” I whisper. “I know child, I know.” He replies. He adds nothing, no condition, no corrections, no requirement, no demands. He simply receives from my heart. “Yes, Papa, I will lay that down. How do I do that?” I wish I already knew, but I cannot see it. “Look in your hand.” He replies. As I do, I find I am carrying a small, smooth stone. Large block letters spelling out “Not Enough” adorn the deep grey, oblong piece. An icy knot forms in my gut as I read those words. They capture the entire situation so very clearly. Never enough. “Give Me the stone.” His words are an invitation, not a demand. He will not take this from my by force. Not shifting from the hold He has on me, I press the stone into His right hand. “It is yours Papa. 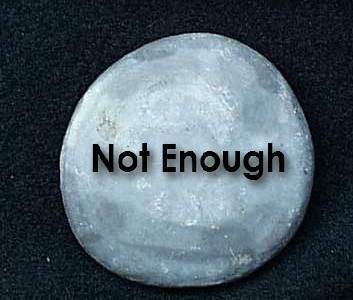 I will not be “not enough” any longer.” I close my eyes and press into Him. His arm tenses as His hand closes around the stone. I can hear the stone cry out and finally break under the force of His great strength. He throws the pieces into the darkness of the cave where they will not be found. They clatter and bounce as they fall. In the stillness of the place, the only sounds I hear are the sounds of Him, the falling water, the chimes of grace, His breath and heartbeat. This place is full of Him and only Him. There is neither room nor place for anything else. There are moments when I still cannot believe myself here with Him, like this. This is all so very different than what I have ever believed or understood. “And what do you think of that?” I an hear a wry smile in His voice. “You are so much more awesome than I ever understood. I love to lose myself in this place, in worship before You. You are truly more incredible that I can ever say. Only You, Papa, only You. Laying my head to His breast, I sleep.